GETTING IT STRAIGHT. STRAIGHTENERS AND LEVELERS TO FLATTEN ALL STEEL TYPES. • Flexibility in a wide range of productions. • Easy to operation and low maintenance. • Compact and modular structure. • Safe for people to operate. • Efficient and economical even with single pieces or small production series. 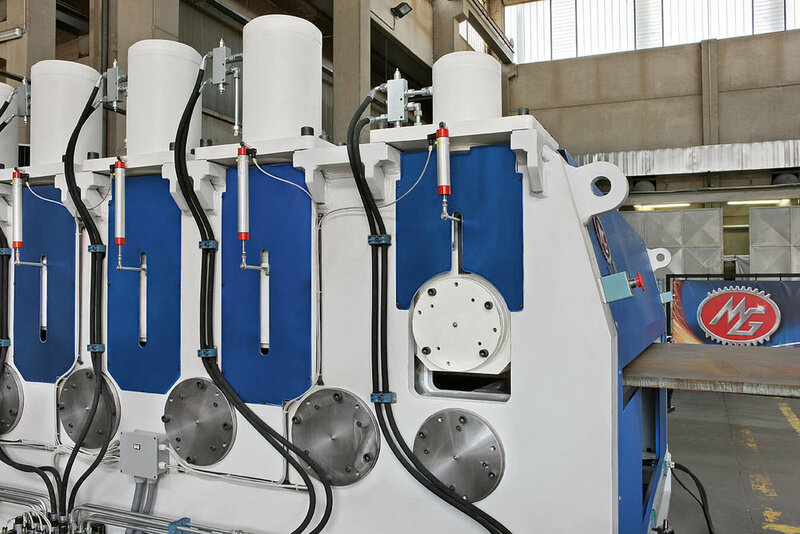 MG produces a complete range of flattening and straightening machines, the ideal solution to avoid problems during the manufacturing process of coils: cutting, profiling, pressing and shearing. In fact, sheets outputs from rolling lines often have defects due to non-planarity: they affect downstream processes, causing costly delays in production. MG range of flattening machines eliminates any possible sheet curvature and undulation, reducing customer costs and problems. Our multi-cylindrical straightening equipment work subjecting the material to "alternating deformations”. Diameter and spacing of the rollers are essential to achieve a perfect result, according to the thickness and type of material processed. The lower rolls are driven by transmission systems studied by MG for this type of metal fabrication. MG straightening machines are able to eliminate all forms of curvature and undulation of the metal sheet plate. With a performing process of plastic deformation alternated through motorized rollers: a greater number of rollers in the case of thin materials and minor for thicker metal sheets. Each machine is adapted to the thickness and type of material processed. 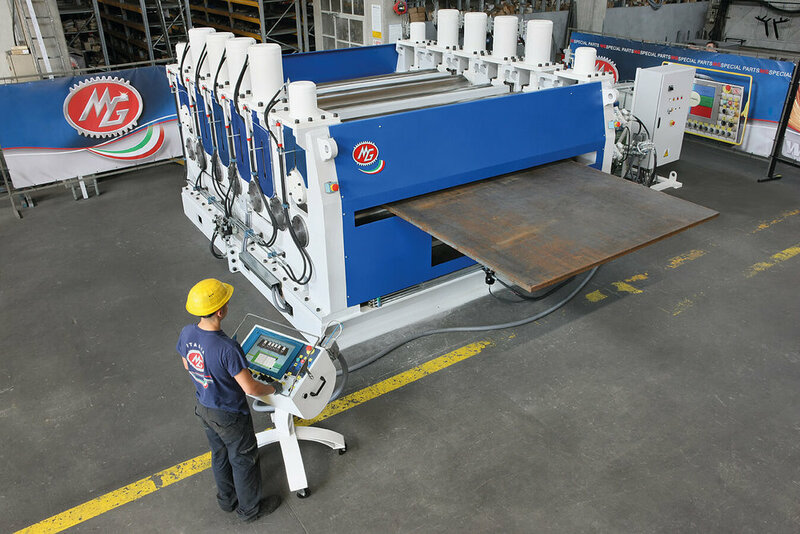 Designed and built with a configuration of 5, 7, 9 rollers (the lower ones are hydraulically controlled), for working metal sheet plates of widths and thickness requested. Rolls are made of fully forged steel and then hardened, so that they can be protected and guarantee maximum durability with any type of metal, moreover they are mounted on double spherical roller bearings sealed and lubricated for life. The planetary driving unit is designed by MG to facilitate the feeding of the sheet metal plate.